The da Vinci Surgical System has been used to help doctors perform complex, minimally invasive surgery on more than three million patients worldwide. But some patients have suffered serious complications that require additional procedures to correct and some have even resulted in death. The da Vinci Surgical System was approved by the U.S. Food and Drug Administration (FDA) in 2000. Intuitive Surgical Inc., headquartered in Sunnyvale, California, is responsible for the manufacturing and marketing of the computer-assisted robotic surgical tool. The robotic technology is designed to be used in complex, minimally invasive surgeries requiring smaller incisions. It allows a surgeon’s hand movements to become smaller and more precise as translated via a computer module by the tiny multi-armed instruments inside the patient’s body. Intuitive further states that the surgeon is 100 percent in control of the system at all times. But several adverse event reports have been submitted claiming malfunctions of the instrument arms that necessitate additional, sometimes larger, incisions in patients in order to manually complete the surgical procedure. 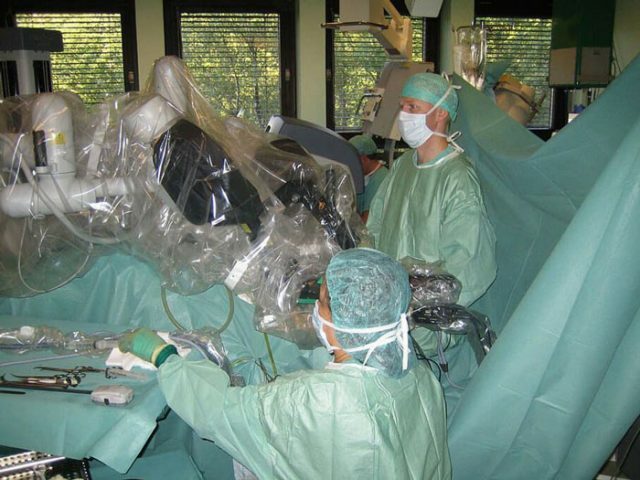 Other complications of robotic technology malfunction include longer operating and anesthesia times as well as several complications occurring from the use of the da Vinci Surgical System itself. Intuitive has issued multiple recalls over the years for a series of issues with the robotic device, including reports of friction within certain instrument arms resulting in interruption of smooth instrument movement. That particular recall affected approximately 1,400 instrument arms sold worldwide. All recalls were classified by the FDA as Class II recalls, meaning the device was capable of causing temporary or medically reversible health problems, with the potential for serious complications being a more remote possibility. There are three main integrated sub-systems of the da Vinci Surgical System which include the surgeon console, the patient-side cart and the electronic cart. The Surgeon Console is the control center of the system that allows the surgeon to view the surgical field and control movement of the endoscopic instruments and endoscope (an instrument that is inserted into the patient’s body to provide the surgeon with an internal view of various parts being operated on). The Patient-Side Cart, with three or four articulated mechanical arms that support the endoscopic instrument arms and camera arm during surgical procedures. The Electronic Cart contains supporting hardware and software components, such as the electrical surgical unit (ESU), suction/irrigation pumps, insufflator and the light source for the endoscope. Endowrist Instruments, which are designed with far greater degrees of motion than the human hand, and each has a specific task, such as clamping, cutting, coagulating (clotting blood), dissecting, suturing. (closing wounds) and manipulating tissue. 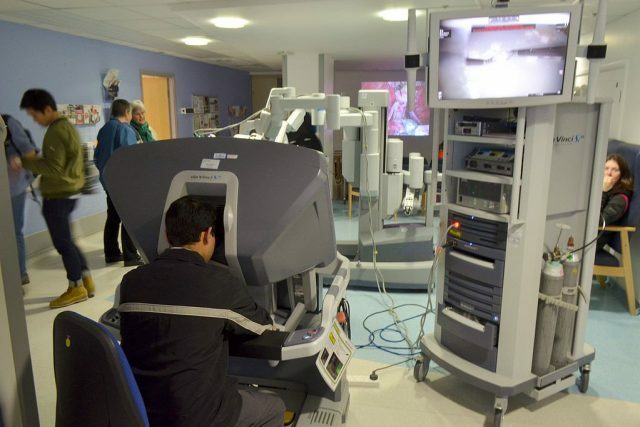 The Vision System, which is equipped with high-definition technology, 3D endoscope and image processing equipment that provides true-to-life images of the inside of the patient’s body; a view of the surgical field is available to the entire team via a large viewing monitor (or vision cart). Who is da Vinci Surgery Used For? Da Vinci surgery can be used for most candidates (adults and children) for minimally invasive surgery. It is designed to provide skilled surgeons even greater visualization, precision and expertise in performing more complex, minimally invasive surgeries, including dissection and reconstruction. Some surgeons report having better success with certain procedures, such as colorectal (bowel or colon) procedures, head or neck surgeries, and heart-valve procedures, than others. In these instances, surgical experts say they are able to maneuver in tighter spaces and achieve a greater degree of motion by use of the robotic hands versus their own. But in 2014, a study published in the Obstetrics & Gynecology journal suggested that surgeries performed with the assistance of robotic technology to remove ovaries or ovarian cysts were likely to result in more complications than traditional minimally invasive surgeries. There was also a 2013 Journal of the American Medical Association study of more than 250,000 procedures that showed hysterectomies performed robotically resulted in similar outcomes as those done by traditional laparoscopic surgeries. Other studies done on other operations, including gallbladder removal, colorectal surgery and procedures to reverse reflux, all showed that the use of robotic assistance in surgery offered no significant improvement over traditional laparoscopic methods. A report published by the National Institutes of Health in 2016 found that over the last decade, more than 1.75 million robotic procedures had been performed in the United States. 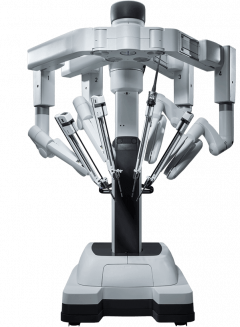 Even with its ever-increasing popularity, the da Vinci robot is currently the only surgical robot approved by the FDA to perform various types of procedures. Other robotic systems designed for minimally invasive surgery in areas such as neurosurgery and orthopedic surgery, or for research in tele-operated (remote) robotic surgery, exist as well. But while the technology is being utilized, it is not without its bumps. Physicians and hospitals are required to report all suspected medical device-related injuries or deaths to the FDA as well as the manufacturer; the manufacturer is then required to report to the FDA when a malfunctioning device is believed to have the potential to pose harm to the public, or when it is known that a device may have caused harm or may have been a contributing factor to an injury or death already reported. In July 2014, the FDA warned Intuitive that if it did not correct alleged violations stated in an increase of medical device reports (MDRs) then the company would be facing equipment seizures or fines. This warning came after a finding that the company was not adequately reporting adverse events and product corrections. But associate professor of surgery at Johns Hopkins University School of Medicine in Baltimore, Maryland, Dr. Martin Makary, claimed the self-reporting system is “haphazard and inconsistent.” Makary contributed to a review of over a decade’s worth of FDA data concerning adverse reports involved in the use of robot-assisted surgery. The review resulted in findings of 245 adverse incidents, including 71 total deaths and 174 serious injuries. Makary said these results show “a larger problem in health care.” “We lack standardized monitoring of new technology to properly evaluate it for safety and efficacy,” he was reported saying by the National Institutes of Health. Any surgery carries with it the potential for complications. While minimally invasive surgery using smaller incisions is typically easier on the patient than traditional surgery, there is still the risk of complications resulting from anesthesia, bleeding and infection. Additionally, robotic surgery has its own unique set of possible complications. Some of these complications can be severe, require additional surgical procedures to correct or can even result in death. The FDA issued a “Warning Letter” to Intuitive in July 2013 addressing the company’s need to remedy certain violations of federal regulations. An inspection conducted by the federal agency revealed that certain components of the da Vinci system were misbranded devices, because Intuitive failed or refused to provide information regarding the device. More specifically, the FDA pointed out that various written reports of corrections to the device and/or removal of certain devices as the result of findings of potential risk to the public were not submitted to the agency as required. The letter referenced four areas subject to Class II recalls in April 2013, for which separate field corrections were initiated but field action was never reported to the FDA. In November 2013, the FDA conducted a voluntary survey targeting experienced surgeons using the da Vinci Surgical System. The study was designed to better understand the surgeons’ perspectives on the different challenges that came about with the use of the system to perform surgery versus conventional surgical procedures. The federal agency further stated that because submissions can potentially contain incomplete, inaccurate, duplicative and unverified information, it is impossible to confirm whether the device actually caused a specific negative event based solely on the information provided in the report. But in a SEC filing on February 6, 2015, Intuitive claimed that legal actions brought against it for allegations of patient injuries were being investigated as complaints since the da Vinci Surgical System could not be ruled out as a direct cause or contributor to the injuries. The company said that such actions were reported to the FDA as MDRs, whether they were considered to be with or without merit, giving further rise to the increase of MDRs. The benefits a medical institution gains by using robotic technology come at a steep price. 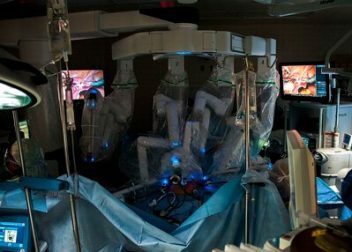 A single robotic surgical system can set a hospital back by about $2 million, and that’s just to get started. Some of the instruments are disposable and need to be continually replaced. Additionally, the systems require regular maintenance at rates that can exceed $100,000. And it’s not cheap for the patients either. Each surgery utilizing robotic technology can cost anywhere from $3,000 to $6,000 more than a traditional laparoscopic surgery, adding up to an 80 percent increase to the cost. But some believe that the substantially higher price tag is not justified by the device. Medical director at Consumer Reports Health, Dr. John Santa, was quoted by Healthline News as saying the da Vinci Surgical System is just a “fancier way of doing what [surgeons have] always been able to do.” He said it’s not the miracle it has been marketed to be. But despite the back and forth commentary, robotic surgery is still on the rise, with da Vinci procedures increasing by 16 percent in the second quarter of 2016, compared to data retrieved from the prior year. Furthermore, Intuitive Surgical brought in revenues reaching nearly $700 million for the 2016 fiscal year.